When you have access to an Align portal and at least one channel in that portal, you can search directly for specific videos on that channel. You'll first need to go to the URL of your company's Align portal page or channel page, with the steps explained here. Once you have accessed the channel you wish to search from, the player will be playing either live content if the channel is live, or whatever off air content has been set for the channel. 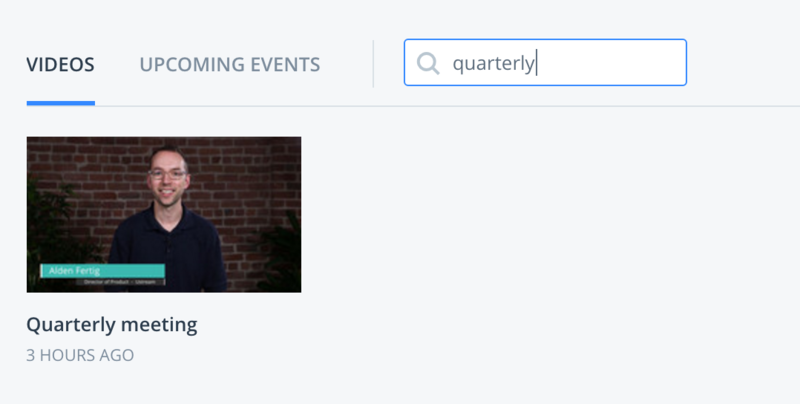 Below the player, you will see a tab for videos, a tab for upcoming events, and a search bar. By clicking on the thumbnail of the video in the gallery, the video will begin playing on demand in the player above.